It requires perhaps some actual knowledge of the growth and development of the human brain to understand how the child's instinct for play can be utilised for health and educational purposes. In one sense, children, like kittens and puppies, play naturally, instinctively, with that joie de vivre which we never recapture in after life. On the other hand, mere instinct will not teach a child what type of play is best, most healthful, and most bene-ficial. The child's playtime can be wasted, not utilised for ultimate good. By the wise choice of play, by organising the hours devoted to play and recrea-tion , by teaching the child directly how to play, a great deal of good can be done by the intelligent mother or nurse. It goes without saying that outdoor play, other things being equal, is better from the health point of view, but when nurseries are well ventilated and kept fresh and wholesome, there is a good deal to be said in favour of play in the nursery. For one thing, the children are not subjected to chill on damp ground, and during the winter months, at least, nursery-play will be probably all they can get on many days. In the first place, let parents remember that children are very imita-live. They do as their parents do. They follow the rules of a game, and adopt methods that are fair, or otherwise, according as they are taught in the first instance. Character is brought out by games, and character can be made or marred according as children are taught to work and play in the early years. A child's brain is impressionable, very receptive. A child has less power of concentration than an adult, and tires more quickly of work or pleasure, so that one of the main ideas should be to associate the idea of enjoyment and pleasure with whatever play or work is adopted. But play also must be combined with discipline, because the will has to be trained and the child's character developed in part through play. The force of suggestion is a very powerful one in dealing with children. A child will consider his play dull or delightful according to the amount of enthusiasm which can be aroused in him by suggestive teaching. Compare the old idea of dull, uninteresting drill lessons with the modern view that children must have variety, interest, enthusiasm for any form of physical culture they take up if it is to do them real good. A play spirit must be cultivated, and to this end the teacher, whether mother or nurse, must be enthusiastic and interested, and the child will follow her lead. What special types of exercises can be utilised for health and educational purposes for the child ? There are innumerable games to be played with a soft ball which the very tiny children even can enjoy and profit by. Catching and throwing is just the sort of exercise that is good for them, in that it raises the arms, expands the chest, gives them a little running exercise, and yet is not productive of strain. Strain is the one thing which must be avoided when play is organised for the small children, and it is with the little ones we are dealing in this article. Teach a child to catch and throw a ball from various distances and points, and you are developing dexterity of eye and hand, co-ordination of different parts of the brain, and the power of judgment. Teach children to throw a ball properly, and you are educating the various groups of muscles, and developing the " muscle sense." Watch a cat jump from one height to another, and you cannot fail to observe what a magnificent " muscle sense" it possesses in noting its power of judging distance and space. Now, it is this " muscle sense " that can be developed in the child by throwing and catching a ball, brick building, or the arrangement of boxes of assorted sizes one on top of the other. This type of play is very suitable for nursery amusement on wet afternoons. But a child's playtime must include such games as cause him to run and use his limbs freely if real health benefit is to be derived. Rounders is a game which will do this, and is very beneficial for the child so long as care is exercised that he is not over fatigued and over strained. When a boy becomes cross and irritable, or shows signs of lassitude, that particular game should be stopped until he has had a definite rest. 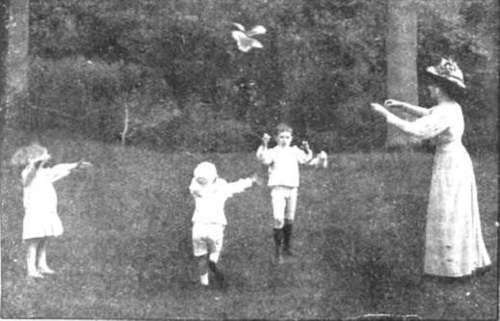 For small children, an excellent way of making them run and jump is by utilising the automatic butterflies or modified aeroplanes, which can be bought in any toyshop. These huge butterflies "wind up" by twisting their large antennae, and then they fly off and remain suspended in the air for quite a time, to the great enjoyment of the children, who immediately give chase. So many children suffer from chest ailments, and are liable to weakness of the lungs and chest, that play which can be used to develop the respiratory apparatus is exceedingly valuable. To this end an excellent exercise is blowing soap-bubbles. Some clay pipes, a basin of water, and a piece of soap to make a lather, can very easily be obtained, and most children love the proceedings intensely. Teach the child to take a deep breath and then blow the bubbles carefully through the pipe, and, when this is done in the sunlight, the effect of coloured light on the soap-bubble is an added joy and interest to the child. Another exercise of the same type consists in blowing feathers about a room or out or doors. Note the boy in the picture. The child's head is kept up, his shoulders well back, the muscles of the abdomen and chest are exercised, and the breathing power is tremendously affected. 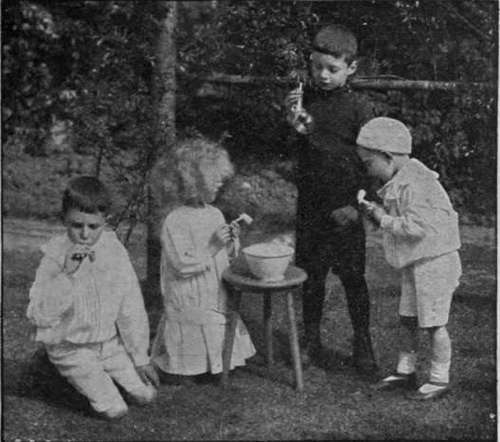 Little competitions can be organised amongst the children, and prizes given for successful feather-blowing and skill at the making of soap-bubbles. 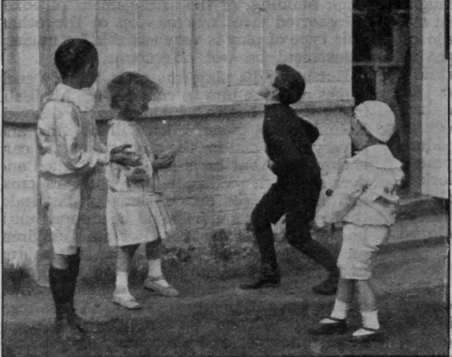 Hoop exercise is suitable for both boys and girls, but some form of competition is almost necessary in this play, as the child very soon finds the occupation of hitting a hoop somewhat monotonous. Organise a race, with the older children handicapped with regard to distance, and interest is immediately revived, and all the children soon become skilful in steering their hoops along rapidly. Jumping exercises are excellent for making children more agile, more quick and deft. At the same time, they develop the thigh and leg muscles better than almost any other exercise, and the children become exceedingly keen on their score. Small prizes add to the interest, and the sporting value of this play is quite evident. 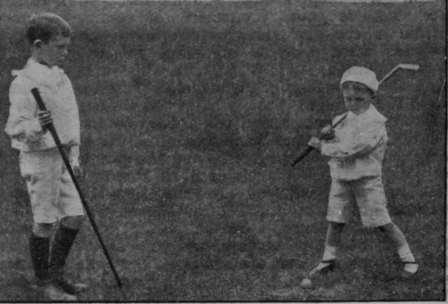 In Scotland, parents who are keen on golf initiate children as young as three years by teaching them to putt and drive, and in a remarkably short time the baby golfer has quite a professional swing, and the love of golf implanted at this early age provides interest and pleasure which may last him till the eighties. Even the babies can be taught putting wherever there is a little strip of grass and a small flower-pot to put in a hole. The training of the senses is another bye-product of playtime. The eyes and hands are working in unison, and such training serves in good stead in after life. Lastly, teach the children that unless their play is regular and systematic, they cannot expect to excel in what they are doing. Concentration and regularity make for self-discipline and character. The healthy mind and the healthy body both can be acquired by the proper teaching and education of children in the art of play. The introspective, nervous, highly strung child who does not like play should be encouraged gently, and made to take up games which do not require the expenditure of a great amount of skill or strength. Play will improve his physical health, and that in itself will make his mind healthier, and counteract any morbid tendencies to solitude and shyness. These qualities are most frequently evinced by the "only" child, who requires, more than any other, to be encouraged to play and romp and enjoy himself if he is to develop healthily. A certain amount of noise is inseparable from play, and the mother who prides herself upon her children being " so good and quiet " should try to see that the natural child is not quiet, and that excessive goodness is often a sign of lack of energy and health. Too much excitement during play is not a good thing, and the children who get excited, over-heated, and fatigued, may have to pay the penalty in restless nights and lassitude next day. 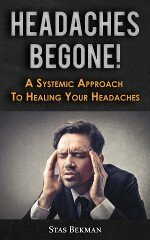 For this reason, exciting games should not be played at bedtime, because a child's brain is very sensitive and easily upset, owing to its instability compared with the adult brain. But the clever mother will recognise these points, and will learn from experience to regulate play, and organise games so that the children will derive the maximum benefit with the minimum fatigue.